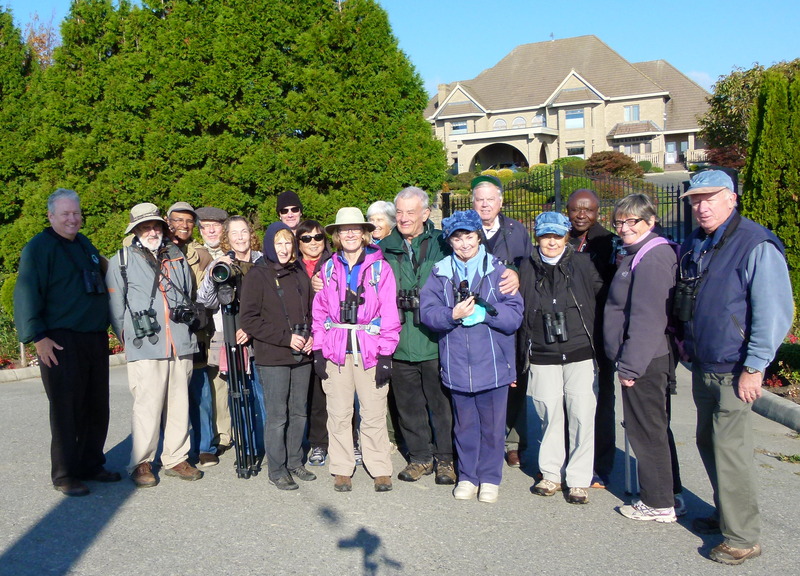 Seventeen DNCBers enjoyed a gorgeous Thanksgiving Monday morning walking the dike path around Boundary Bay from 104th Street to the Mansion and back. 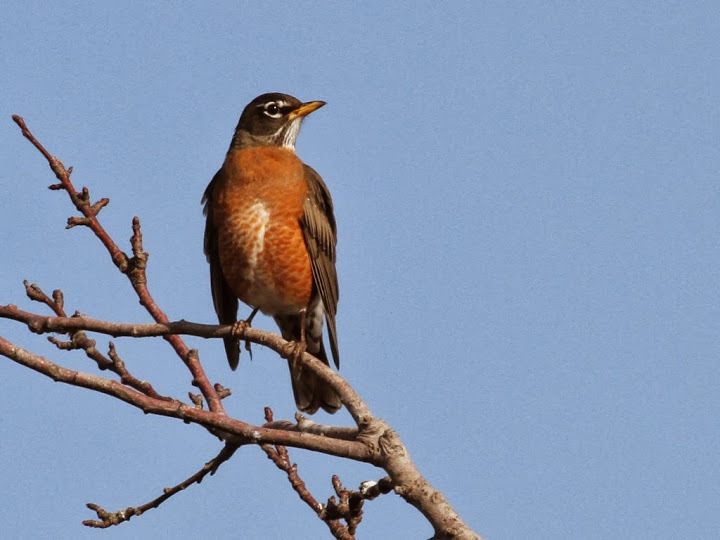 Hi-lites included American Pipits, Pectoral Sandpipers, both Kinglets, and thousands of ducks. Check out Roger’s, Tony’s and Jonathan’s photos (soon) on our Blog at https://picasaweb.google.com/DNCBirding. Three vehicles and eleven of us (Mike with Roger, Lorna & Hans, Bryan with Kirsten & Sheila, and me with Scope Martyr Moira, Gerhard and Marian) left Petra’s at 7:30 a.m. It was foggy and the tide was way out when we arrived at the Heritage Airport parking lot and met Tony, Jonathan & Lorraine, Jean, Donna and Richmond Bill, so our aspirations for a good morning of birding were not high. However, following the cursory introductions, when we wandered up to the dike, the fog had lifted and the sun began to shine brilliantly. We scoped the Bay and there were thousands of specks on the horizon, which are boring to us “candy birders”. So we started walking. There were lots of LBJ’s (Little Brown Jobs) in the shrubs and grass along both sides of the trail. We recognized and got good looks at five Sparrow species; Song, Fox, Savannah, White- and Golden-crowned. We also saw both House Finches and American Goldfinches. A couple of neat sightings were Golden-crowned and Ruby-crowned Kinglets and perhaps an Orange-crowned Warbler (or immature Common Yellowthroat). Since the tide was out only a few Shorebirds were close by such as Black-bellied Plovers and we were not able to pry a Golden Plover out of any of these sightings. Small flocks of Dunlin swarmed by on occasion. At the pylons of the old Oyster Farm we spotted six or seven American Pipits, one of our destination birds, feeding on shore. Then further along, four or five Pectoral Sandpipers, another destination species, were close in for great looks. Lots of Northern Harriers gliding by us and a few Bald Eagles too, but we saw no falcons (Merlin or Peregrine) this morning. On occasion in the distance thousands of waterfowl would periodically take to flight, but we couldn’t detect what might have disturbed them. Nor could we determine the species; probably Northern Pintail, Wigeon, Mallards. At the Mansion we saw a bunch of Northern Shovelers, Green-winged Teal and a few American Wigeons. There was also a resting flock (40) of Dowitchers with one Lesser (?) Yellowlegs. Roger took the obligatory Group Photo with the Mansion in the background. 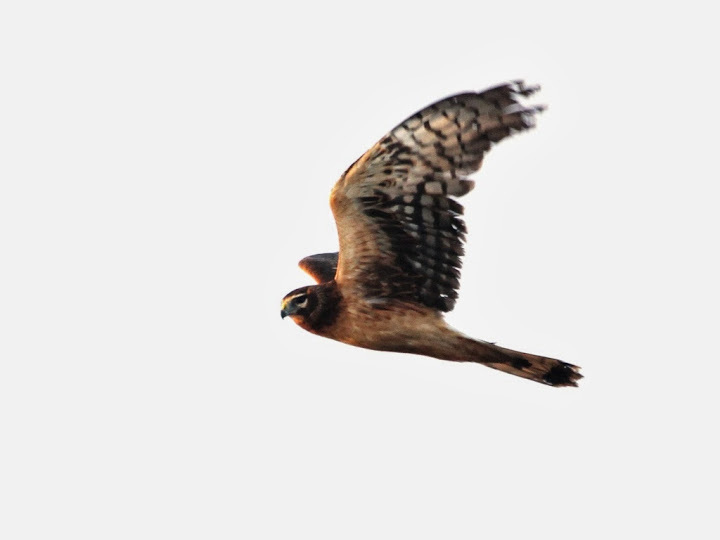 The farmers had already harvested the potatoes and we did not see many birds in the barren fields, other than Starlings, Robins and Crows; one brilliant female Northern Harrier sparkled in the sun. It was quite a long walk back from the Mansion as we passed many cyclists and dog-walkers enjoying the beautiful morning. The seventeen of us bonded in our usual inane manner, talking about what we “could have seen” and how hungry and tired we were, but still having fun. Back at the Heritage Airport, approaching Noon, reliable PB Lorna brightened me up with an egg salad sandwich and a chewy bar. Moira brought some walnuts and Kirsten finally shared a couple of tidbits of cheese. No one brought beer. It was getting late, so we did not stop at the North Forty Park to show-off our new Barn Owl Box as we had planned, so we missed “sleep-ins” Ken & Anne who spent the morning waiting for us there. I won’t mention the litany of inarticulate conversations between Garbling Gerhard and Majestic Marian in the back seat on the ride back to Tsawwassen. Another wild and wonderful DNCB outing. Next Monday, October 21 Roger and I will be at Petra’s for departure at 7:30 a.m. to Queen Elizabeth Park, then Van Dusen Gardens. For those joining us in Vancouver, we plan to meet at meet at the QEP parking lot above the tennis courts and near the entrance to the small golf course. We should be there before 8:30 a.m. We’ll leave QEP around 9:30-9:45 a.m. for Van Dusen entrance at 10:00 a.m.; Entrance Fee $7:75 adult, $5.75 senior. This entry was posted in *DNCB, 104 Street, American Pipit, Bald Eagle, Northern Harrier, Pectoral Sandpiper. Bookmark the permalink.